As I said in my essay The Right Revolution, it’s very important to understand that the reason our society keeps producing more devastating toxins (physical & mental) is because the foundation of this society is toxic, it is based on injustice and lies that inevitably perpetuate more and more of the same. Whether it’s massive petroleum oil spills in the oceans or terrible nuclear power-plant disasters, or the aquifers of communities being filled with toxic chemicals or depleted uranium weapons used in military operations (from Iraq to the beaches of Viesques), all of this has the same origin: social-systems. None of these life-destroying wasteland-producing events could have taken place if it was not for the funneling of enormous wealth and power to the few by coercing the many into being dependent money/tax-slaves. If you think these events are not all connected to that root injustice, if you think that it’s just a matter of having more democracy and oversight so that we can prevent these tragedies from happening in the future, I understand your perspective (I used to share it), but ultimately that perspective is ignorant and unintelligent, in denial of the cause and effect aspect of the reality in which we live. You can’t ignore the root (forced participation in social-systems) when complaining about the fruit (toxic destruction on a mass-scale), but that’s what most people still do, mainly because they have been relentlessly propagandized from a young age that social-systems are natural and good, and they hold that irrational and false belief that skews their perception of the world around them. When the next disaster happens, rather than just shake your head in frustration, try to do some critical thinking as to whether if no one was coerced into funding corporatist-state military-industrial-complexes (and could live freely, naturally, self-sufficiently and sustainably off the land via veganic homesteading) it could have ever happened in the first place. Second, read the books “The Fluoride Deception” by Christopher Bryson and “The Case Against Fluoride: How Hazardous Waste Ended Up in Our Drinking Water and the Bad Science and Powerful Politics That Keep It There” by Paul Connett, James Beck, and H. Spedding Micklem. Third, read what I have to say: We are told “it’s good for your teeth”, even though thousands of doctors and scientists disagree, presenting the evidence that fluoride is a TOXIN that does only harm to the body, specifically the brain, and lowers IQ. A quarter oz. of sodium fluoride in your toothpaste is considered poisonous and if swallowed you are alerted to contact a poison control center, but the same amount of that same fluoride is in a single glass of tap water (and your supposed to drink 8 a day! ), but there is no warning on that, in fact they say that’s good for you! 98% Of Western Europe has rejected water fluoridation (including Austria, Belgium, Denmark, Finland, France, Germany, Italy, Luxembourg, Netherlands, Norway, and Sweden). Fluoride is a powerful poison – more acutely poisonous than lead. This explains why fluoride is the active ingredient in many pesticides and rodenticides. It also explains why accidental over-ingestion of fluoride ca n cause serious toxic symptoms. As documented in the Journal of Dental Research (Whitford 1987, 1990), there is enough fluoride in a tube of flavored children’s toothpaste to kill an average-weighing child under the age of 9. EPA scientists, along with many others, have called for a ban on water fluoridation, yet it continues to be added to the public water supply every day! Why?! The same goes for Chlorine, and Aluminum, which are added to our drinking water by the State in water-treatment plants to “purify” the water, while ignoring the negative health effects of these other toxins, as well as rejecting safe filtration/purification alternatives. Since the State is fundamentally against Nature, and is fundamentally violent, it actually makes sense that the most important thing for life to exist, water, would be filled with toxins by that toxic social-structure; this is a crucial understanding that should be kept in mind while reading on about other toxins we are unnecessarily exposed to, it is seeing karma manifest. 3. Toxic sweeteners: like aspartame, available for free at almost ever diner table in America (strange that toxins are free but organic food is expensive isn’t it?). Meanwhile natural alternatives to sugar like Stevia, which have no side effects whatsoever, has been called an “unsafe food additive” by the FDA. Also artificial food colorings, directly linked to many health problems, are perfectly legal. So poison is OK, but natural non-poison is bad. Also now that there has been extensive public awareness about the dangers of aspartame, the government, directed by the corporations that make these toxic food additives, has approved a similar chemical called neotame, and also approved that this chemical does not need to be listed on the list of ingredients, and can be included in certified USDA organic foods! Just like with vaccines (discussed more below), corporations and government think they have the right to put things in your body without your knowledge or choice, and that’s pure tyranny! Welcome to the Orwellian world of Corporate America. It would be a mistake to think that if we get them to label a couple toxins we have found out about (who knows what we are unaware of!) we would be safe, there are thousands of untested chemicals allowed in cosmetic and other products (often just labeled “fragrance” or “inert”) and there is no way that government/industry is going to ban them all until each is tested to be safe, that would be too much of a profit-loss, and that’s all they really care about it. What needs to be remembered is that there is always the danger that those with the power to do things like put secret chemicals in our food, water and air may do so, and this is one of the reasons why we must eliminate these positions of unnatural power so these kind of things can’t happen anymore. Social-systems have always been toxic, for centuries, it is only now that with the creation of artificial toxic chemicals and modern technology that their true nature is becoming even more clear, hopefully the masses will awaken to this truth before the Earth and our bodies become irreversibly toxic and damaged. Already the umbilical-cord blood of babies is filled with hundreds of toxic chemicals, and women’s breast milk has been filled with so many toxins that qualifies as hazardous waste unfit for human consumption according to current standards. Are we just going to abandon being natural homosapiens and submit to becoming homotoxicus? Vaccines are a pharmaceutical product, and that industry has a consistent history of malpractice. 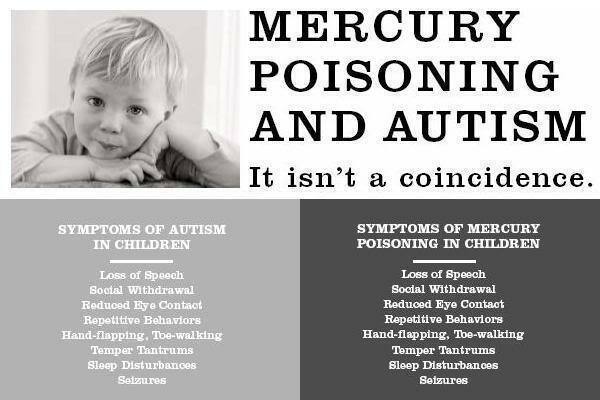 One company, Merck, puts highly toxic mercury in their vaccines, a proven neurotoxin. Tens of thousands of parents have reported that their healthy child suddenly became very ill, many becoming autistic, after vaccinations. Many of these parents formed a rally in Washington, D.C. called “Green Our Vaccines”, where thousands attended. GREEN OUR VACCINES! Why the hell is such a rally even necessary?! Why the hell are our vaccines TOXIC?! Robert F. Kennedy gives an amazing speech about government cover ups and the harmful effects of toxins in vaccines. Part 1 of 2. Green Our Vaccines Rally. Why is a group like “Mom’s Against Mercury” necessary?! Various government officials, with their official reports, say this is just “conspiracy theory” and that these tens of thousands of children just happened to get autism and other illness right after receiving massive doses of vaccines, “by coincidence”. Yes, just trust Big Brother once again, don’t rely on your own instincts or common sense, government and corporate officials always tell the truth after all, especially about things that would implicate them in a crime! Only a wacko conspiracy theorist would think otherwise! Being forced to trust someone, especially someone in a position of power, is really what’s crazy; many people become unthinking and pathetically subservient when anyone in a position of “official” authority tells them what is true or good, even when common sense shows it to be false and bad; this is the power of indoctrination/conditioning. “Many in the medical community continue to dismiss this as a mere happenstance because autism often coincides with the time of vaccination and state that there is no scientific evidence to back this up. My question to you is, how long does it take for a coincidence to surface time and again, case after case, before it can become a viable hypothesis, especially when the solution to solving this problem seems so apparent? How can pharmaceutical companies concoct substance with mercury, formaldehyde, antifreeze, lead, aluminum and live viruses not expect that as they continue to pour these highly toxic and reactive substances into children, increasing dose after dose, all on the same day even, that it WON’T alter their developing minds and bodies? Why would it be so completely impossible for a child to actually contract a chronic form of the disease rather than have a “proper immunological response,” especially when their immune systems may not be up to par? And where is THEIR scientific evidence to back up the claim that this cannot happen, when it is published in the very package inserts, in their writing, that they have not studied the effects of vaccines for more than few weeks, or longer than the incubation period of the disease itself? What happens when you give multiple doses in one day or combine different diseases into one hypodermic needle? Could someone explain to me why it is acceptable to have products on the market that exposed my child to 37.5 micrograms of mercury in one day when at the time he should not have been exposed to more than .59 micrograms of mercury given his body weight? Even a body as big as mine shouldn’t be exposed to more than 5 micrograms of mercury in one day. That is completely unacceptable. One size does not fit all when it comes to vaccines. In recent years it appears they are phasing out the mercury in vaccines, but there are still other toxins, like Formalin and Aluminum (linked to Alzheimers, Parkinson’s and Lou Gehrigs disease), along with many other toxins, and those are only what we know about, since THE FULL INGREDIENT LIST ON VACCINES REMAINS SECRET! WHY WOULD YOU INJECT YOUR CHILD WITH SOMETHING IF YOU DIDN’T KNOW WHAT IT WAS? BECAUSE YOUR FAITH IN AUTHORITY IS THAT GREAT? If so, that’s your choice, but be sure not to criticize those that choose otherwise. Many people in the “land of the free” and elsewhere around the world have lost sight of the importance of personal freedom, and have accepted collectivist indoctrination, and this is much more dangerous than any unvaccinated child will ever be; it is the slippery slope to increasing tyranny from government officials, who remember are not (and never have been) saints by any means! To trust a few people with immense destructive power is not intelligent, it ignores all of human history and the constantly re-affirming fact of human fallibility we see every day. We need to mature to the point where we investigate things for ourselves and make independent decisions, not based on propaganda or blind-faith, but on facts and common sense; especially concerning our children’s health and safety. They have no right to force us to put ANYTHING into our bodies or our children’s bodies that we don’t want to, that is a fundamental human right, that’s why on that level All debate as to whether vaccinations are safe or not is actually irrelevant. The real issue is whether individuals have the right to control their own bodies or not. If an individual does not have that right, they are technically the slave of another, in this case a slave of the government. Of course vaccinations have a history of many ill effects, but this back and forth on what study is valid and which is discredited (the voice/lies of government/corporations being most dominant of course thanks to the corporate media, a.k.a. the “4th Branch” of the government) is really just a distraction from the core issue of freedom vs. tyranny. If the government can tell you what you can put in your body, like alcohol but not marijuana, and force you to put something in your body that you don’t want, like a vaccine, you are not free. It is always in the name of “safety” that governments violate the rights of the people, and often the “danger” is manufactured by the government officials themselves in order to justify their police-state measures, as was clearly the case with 9/11 in New York and 7/7 in London. Being forcefully vaccinated when you currently have no contagious disease is a “preemptive” attack on your body and a violation of your rights, supposedly to prevent the possible violation of other people’s rights, though that may never actually happen. No one should have to apply for a waiver or face any penalty for their choice of nonviolence concerning a pre-emptive and possibly dangerous series of injections to themselves or their children. This is the most important aspect of the vaccine debate: the issue of people being forced. Whether or not many other people say that it is for the greater good or not, the fact is that this amounts to some people initiating force against other people, it is an act of violence and tyranny. When we hear in the mass-media (all owned by only a few corporations, which are often tied with the pharmaceutical industry) “this government or pharmaceutical company study says it’s perfectly safe”, that very well may be a lie, or at least mistaken, but the “common people”, i.e. the “citizenry”, are told to shut up and just have blind faith in those deeming themselves their parental overlords. Anything compulsory equates to saying your opinion is extraneous and inferior to those of people employed by controlling institutions; your doubts are made irrelevant because in the view of the controllers, they are superior to you, they have the right to control you and your children because you are inferior to them. If we accept mandatory vaccines, we open the door for other mandatory actions against our personal sovereignty; we become more and more the property of government, to do with as however they see fit. 1) Most doctors coming from mainstream medical schools are heavily influenced by corporate interests, their education has been greatly corrupted and limited by industry. To expect them to have knowledge of key aspects of relevant subjects like nutrition and environmental toxicity is wishful thinking, they are for the most part very ignorant in these crucial areas. 2) It’s irrelevant to the larger issue of personal freedom and choice. People have the right to control their own bodies and not be forced to do anything they don’t want to do by others, whether they are truly good-intentioned doctors or not. Also to ignore the countless times doctors and officials have lied, or were at the least mistaken, and caused severe harm, and to think that somehow the current establishment authorities are faultless saints upon the Earth who could never cause harm through their authoritarian actions, intentionally or not, is absurd. This underlying assumption, this unquestioning trust in authority, is not logical or principled, it is merely an opinion, an opinion that is heavily shaped by indoctrination. Like mandatory taxation, mandatory vaccination is being forced to do something that may be against your will, for the supposed “greater good”, despite the lack of proof, and despite the contradictory historical facts; authoritarianism can never be perfectly safe or principled because of human fallibility, which can lead to things like, say, your tax dollars going to fund a war based on lies that kills millions of civilians in another country. But again, there need be no examples of this violation of trust; the fact that it is even a possibility means that from a human rights perspective, no one can be forced to do something (i.e. be subjected to violence) because it may be for the “greater good”. The only thing we can say with certainty is for the greater good is nonviolence, and therefore mandatory vaccinations, along with any other mandatory act (like taxation) is immoral because it is the initiation of force, it is violence. Authoritarianism & violence is immoral, personal freedom & nonviolence is moral. End of story. What could be more crazy than being told that poison is good for you, and truly beneficial things are bad? Ignore the lies you’re being told; don’t drink toxic water, eat/drink toxic sweeteners, inject your body with toxic vaccines or fill your mouth with toxic fillings, and tell your “representatives” that you want these mass poisonings of the public to end, but don’t rely on them to, since that will probably never happen; the best thing you can do for your health (and your freedom) is disconnect from their system of social control by living as a sovereign and natural human on the Earth.